RORATE CÆLI: Catholic Divorce - Canonical critiques of annulment reform are piling up: Will the Vatican, the bishops, and the Francis "Amen corner" listen? Catholic Divorce - Canonical critiques of annulment reform are piling up: Will the Vatican, the bishops, and the Francis "Amen corner" listen? Can zealous Bishops and Cardinals question the Annulment Reform and ask for its abrogation? For the record: Cardinal Burke's latest address on the Synod and "Annulment" Reform. Rorate reminder: 2015 Synod poised to assault Humanae Vitae too. 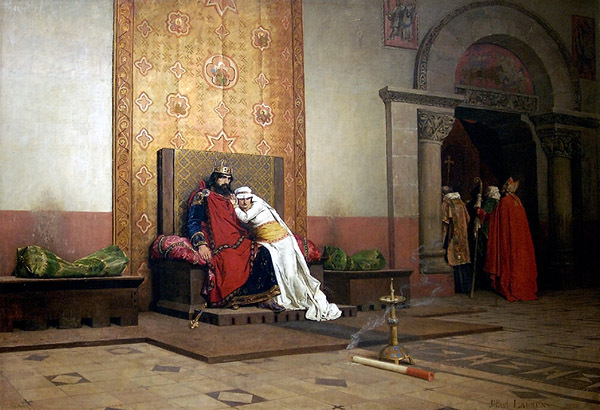 The Excommunication of Robert II "the Pious" - painting by Jean-Paul Laurens. Something is definitely in the air: Prominent canonists initially lauding the marriage nullity reforms, then backtracking, then public coming out strongly against these, and very real talk of discontent among a significant number of canon lawyers and prelates. And we're not talking about traditionalists here! The Pope's arbitrary and highly problematic reforms of the process for declaring marriage nullity, worked out with no widespread consultations and in relative secrecy and published on September 8 through the motu proprio Mitis Iudex, is fast turning into an unprecedented crisis of authority for his rule. The crisis of authority is real and no amount of denial and snubbing by the Catholic media establishment and by "respectable" Catholic bloggers can hide it. These three experts soon began to come up with more critical responses. Within several hours Ed Peters began posting more analyses, each more critical than the last: 1) A second look at Mitis, especially at the new fast-track annulment process (September 8), Nah, that twern't no smear, (September 10), Who is satisfied with Mitis Iudex? (September 13), and the last one so far - Note: Avoiding the requirements of Mitis would not be easy for bishops (September 14). Ed Peters' criticisms and reservations regarding the reforms have been widely discussed on Catholic blogs and websites and we will not be discussing these further. Ed Condon's "A Modest Proposal" (September 12) still professes that "there is more good than bad to the reforms" but dwells largely on the very serious dangers inherent in the "short process" as authorized by Pope Francis. Mr. Condon also has the following anecdote about the increasing lack of juridical expertise among the "Defenders of the Bond" -- the officers tasked with defending the presumed validity of the marriage under question -- a lack that will only be aggravated by the new reforms. In my own experience of marriage tribunals, which is pretty diverse, more often than not none of the participants will have doctorates and only some of the judges will have licenses. In fact, usually it will be a single clerical judge, not a panel of three (formerly an exception widely granted in the United States, now made a universal option by Mitis Iudex) and the parties will usually not have advocates at all, when they do it is rare for these to be canon lawyers. Less than half of the opinions from defenders of the bond which I have read as a judge are signed by a JCL. Usually they are signed by a priest, or increasingly a permanent deacon, without a canonical education and who has been assigned as defender of the bond as an unwelcome addition to their normal pastoral work in a parish. One defender of the bond I know actually submits exactly the same one-page brief for every single case to which he is assigned, and they have never yet penned an appeal. This is made possible because a tribunal can petition the Apostolic Signatura to allow them to appoint “otherwise expert” (read “formally unqualified”) people to these positions when they are unable to come by enough qualified staff. This isn’t to say they do not mean well, work hard, or merit respect and gratitude for their efforts; but it is ridiculous to expect them to fulfill vital roles like defender of the bond. Does anyone think either party in a marriage nullity case would consider allowing someone without a law degree to represent them in their civil divorce proceedings, still less a well-meaning volunteer? This is for the current process, in the United States which has one of the world's highest (if not highest) number of canon lawyers. We ask: how much more under the shorter, more "streamlined" process authorized by Francis, intended to open the doors to a deluge of applications for declarations of nullity? On that same day as Conlon published his cautionary article Benedict Nguyen gave a brief interview on National Catholic Register radio (September 12 -- listen here). He spoke clearly about the lack of consultation with the world's bishops and canon law faculties by the Pope's appointed commission, which worked by itself in secrecy. He also mentioned the desire of many canon lawyers to see an extension of the vacatio legis given by the Pope before the reforms are implemented (December 8), for the sake of widespread consultation in the Church over these reforms. Within a few days he had published another article, this time on UK's Catholic Herald, which had shamelessly praised the reforms only the previous week. ...Many respected canon lawyers and commentators are expressing grave concerns about the text as they study it more carefully. I join my voice to the growing number who are apprehensive. In my view, some changes run the risk of doing more harm than good, creating more confusion than clarity about the truth of marriage and the purpose of the declaration of nullity process. The result is that some marriages will be presumed invalid even before the process starts. This runs directly against the presumption of validity required by justice, logic and canon 1060. Mitis Iudex has created a situation where marriages are presumed to be invalid and that validity must now be proven. Not unlike certain ambiguities and vague expressions which found their way into the official documents of Vatican II, the “etc.” in Article 14 §1 will, I contend, be among the most potentially abused targets of heterodox interpretations found in the new norms. This abuse will be made possible by the vast reservoir of administrative discretion granted to diocesan bishops under the reformed law. While it is true that certain basic requirements must be met in order for a case to be heard according to the processus brevior, it is equally true that these requirements are not very difficult to satisfy under the new norms. ... it would be rather naïve to believe that the processus brevior will be something exceptional or rare in contemporary tribunal practice. Indeed, if recent trends in canonical penal procedures provide any indication as to what we can expect to see in the near future (the past two years have witnessed a concerted effort led by the Congregation for the Doctrine of the Faith to move away from judicial trials and establish shorter administrative processes as the norm), it is the opinion of this author that, in similar fashion, the processus brevior will gradually become the new norm in tribunal practice. This shorter process will undoubtedly open the door for abuse in the administration of justice as many roles will be placed in the hands of one and the same person, the bishop. On that score, one’s confidence in the marriage nullity process will necessarily hinge upon one’s confidence in the bishop who pronounces judgment. So far, the bloggers of Rorate have not seen a single, non-liberal, extended commentary on Mitis Iudex that is overwhelmingly in favor of it, and which has not been retracted in some measure. It is true that some Catholic dioceses and bishops' conferences have published press releases praising the reforms, but frankly this is to be expected. Some conservative Catholic dioceses (e.g. Madison, WI) have published commentaries trying to minimize the sweeping nature of the reforms, but these strike us as more in the nature of damage control. Indeed it is not realistic to expect dioceses to put out official criticisms of Roman decrees. Nevertheless it is no help to the truth when bishops to try to put a nice face on an enormously bad piece of Church law, particularly one with consequences for the reception of doctrine. Nevertheless we hope that before long, canon lawyers will band together to press Rome in a public and organized fashion to delay the implementation of Mitis Iudex. No less than the historic consistency and credibility of the Catholic Church and its teaching on marriage is at stake. It will be a great and terrible irony should the Feast of the Immaculate Conception this year become the day when this teaching takes a massive blow from which it might not recover for many generations, if not centuries.